The 3rd Upgrade! International Gathering will take place in Skopje, Macedonia from September 11-14th, 2008. Growing from the Upgrade! International community, this event takes the form of a city-wide digital art and networked culture festival including exhibitions, screenings, live local and streamed performances and a program of critical and active lectures and workshops exploring numerous facets in the field of digital art. The thematic focus ‘Chain Reaction’ explores issues of cultural development and growth in the local region as well as within digital networks. Exhibiting works and presentations from over 20 cities across the world, the organizers of this event expect this event to be a catalyst for dialog, future collaborations and new cultural understanding. Urban Programming 101 Workshop is originally designed as a 5 to 7 days workshop, last in the series of workshops following ‘Urban Codes’ and ‘Urban Hacking’. The workshop is a partly educational, but it is intended to function mostly as a platform for local participants to create new work. The thematic emphasis is on implying philosophy of computing and practice of opensource software into the physical reality of public spaces. Taking examples from public art, site specific art, happenings and performance, locative and mobile media, the workshop introduces various methods of artistic intervention in public space. The content of the works are mostly based on the participants idea and decision. The role of organizer is limited to creating constructive environment and guiding with appropriate critique. Since the artist/ organizer has less than basic information about the specific city and the urban spaces which the workshop is conducted, the participants role is to educate the organizer, and themselves through conversation and exploration. The participants are not professional historian, and most of the information are impressionistic sketches based on personal experience. It is an oral history of the urban space as seen by the local inhabitants, and documented by a tourist. The project was conceived with the help of Upgrade! International, Upgrade! Seoul, Line Initiative in Skopje, European University in Skopje, in September 10~13, 2008. The workshop consist of my lecture in the topic, exploration of city by collective walking, discussions, and realization of participant’s own project. The following material is a mixture between knowledge collected during the sessions, my observation of the participants project. Skopje is as a unique example in the context of urban development. The 1963 earthquake destroyed much of the Ottoman heritage. Reconstruction of the city was executed partially under the master plan of Japanese Structuralist architect Kenzo Tange, and the city did not change much for 40 years. The urban spaces of Skopje has multiple layers of reality. Instead of traditional charm of the East European or Balkan city, the urban spaces are designed to function as a machine for living. The modernist design which stress function of living space via structuralist formalism, puts efficiency over aesthetics. The city is segregated, mostly based on the division by the river. The stereotypical understanding of the norther part is inhibited by the immigrants including Albanians and Muslims. The modern southern part is Christian and Macedonian. Such generalization of segregation is often very false, but insightful in the beginning of learning about a city. The another reality is that of corporate gentrification of the the city. It is beginning to happen within the central part of the city, however the situation is not yet crucial. Skopje has very little remains of the city prior to the earth quake in 1963. The city has its history erased by a natural disaster. 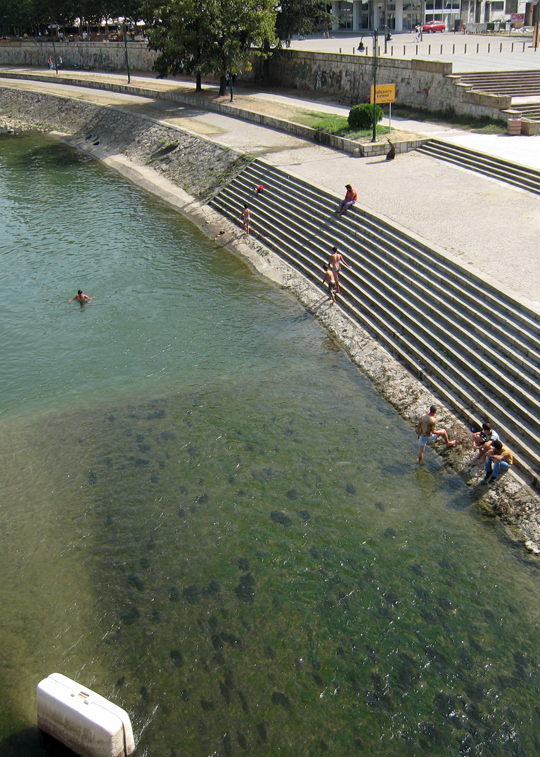 One can compare a city like Skopje with a city such as Hiroshima or Dresden. In contrast to other city that has its history erased, equally or more abruptly, by war and bombing, Skopje does not have the harsh bitterness. Skopje can be compared to a city like Kobe in Japan or New Orleans in USA, where earth quake and hurricane has destroyed the city. These cities heal efficiently in a state controlled urban development plan. However the state often neglects low income housing district and leave thousands of people essentially homeless after the disaster. 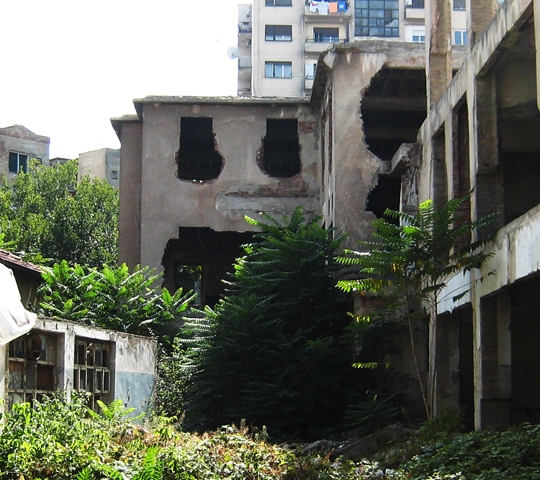 The fairness of redevelopment of Skopje still remains questionable to me for the lack of resources. Therefore, the effect of rapid modern urban development can be evaluated after the 40 years of its use. The city park is vibrant at all times, in contrast to the desolate city square. City park is filled with youngsters even late at night. There are not enough bars and places to go out. Young people find themselves hanging out in the park, smoking cigarettes, talking with friends, and sometimes dancing. The law of alcohol purchase changed recently to restrict purchase after 7 PM. Combination of the law and shortage of bars, and also high price at the bars, result in more people hanging out in the park. The city square, located between the old and new city in the central site, is empty most of the time. Among the workshop participants, ones in their late 20’s remember the time when the Square was full of people. Street artists, musicians, and family were frequently visiting and the space was full of energy until the turn of the Millennium. Most of the younger participants in early 20’s do not remember anything positive about the square. They only remember political demonstrations and lack of life. Apparently some large events, including queer parade, were canceled by the city. The city plaza is now a symbol of forced normality and unnatural landscape. The city is planning to erect new big museum and an Ottoman church in the plaza. The most horrific plan is to put series of sculptures that depict various social groups of Macedonia, including baggers. Public art that attempts to represent specific members of the society often unintentionally construct misrepresentation. The tea house and cafe of Skopje still contain the romantic notion of Parisian cafe as a psuedo public space. In contrast to international standardization of cafes with a corporate branding, such as the Starbucks chain, the cafes in Skopje are still unique and favorable environment to its patrons. The cafes function as a meeting place. One can go to a cafe at any point of the day, at any central location, and expect to find someone they know. It is not uncommon to sit alone or meet someone new in the cafe. Also one can expect to call up a friend at any point in time, and they will come out of work or home to have coffee with you. The ritual of going to a cafe is the distinguishable character of the culture. In casual conversation, “Having a coffee” means broader social act, including a meeting for business and hanging out with friends.If the event is not for business, people often end up drinking beer or having a meal. The trip to a coffeehouse is very important part of the daily life. No matter how busy they are, Macedonian finds time in the day for a trip to a coffeehouse. One participant in the workshop criticized the peoples favor of cafes for being lazy and irresponsible. His claim was that some people can be found in cafes at any point of the day. He was irritated that it seems like they can live in comfort without working. As a reaction to the cafe culture, the workshop participants decided to make 20 cardboard coffee cups. There were few interesting, but unclear possibilities on using of the cups at the time of production. The participants were struggling to come up with a a solid idea. I felt encouragement was most needed and supported the idea. All the design and production was done by the participants. Street Macedonia is the main avenue in Skopje. The central street in the city is filled with cafes and restaurants which locals and tourists enjoy alike. 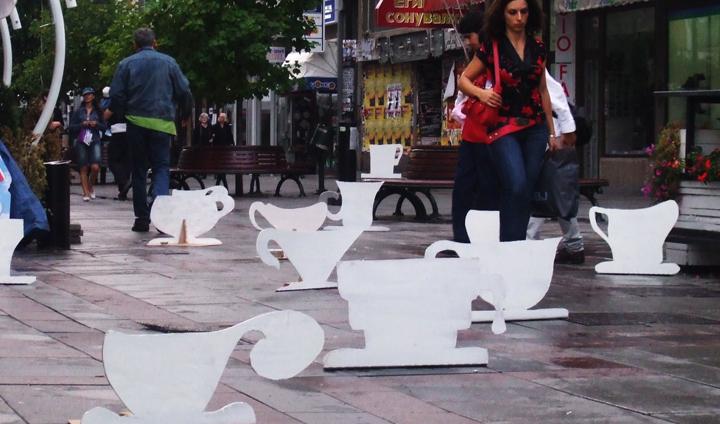 Workshop participants placed the coffee cups were placed in the space between cafes, where most human traffic occurs. The participants made some instant coffee and shared it among themselves in the busy street. Most pedestrian did not respond at all. Some found it amusing and started conversation with the participants. I made a following suggestion to the participants. When working with passive public, it is helpful for artist to take on a more theatrical role to initiate interaction and participation. Imagine the participants are wearing a picket saying “Free Coffee” or an oversize cardboard coffee cup. The props and situation will turn the participants into performer, thus it is easier for general public to reach them. 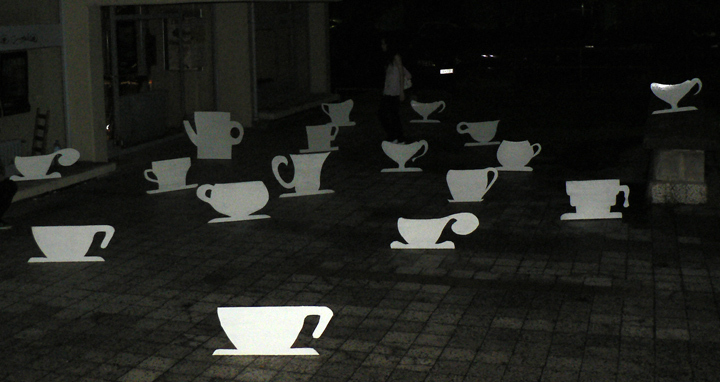 The coffee cups were placed in traffic island as well. The drivers is Skopje are extremely aggressive and often does not stop for the pedestrians. This leads to tension between the two group of people, and naturally the traffic island is an under appreciated piece of urban space. 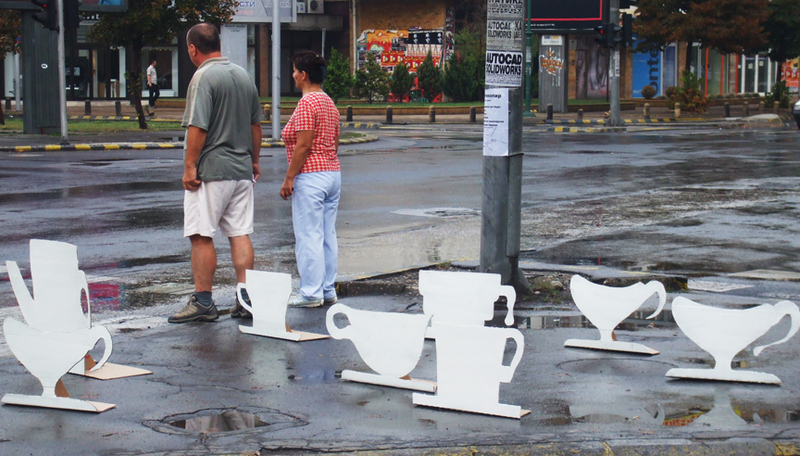 The participants transformed the island into a temporary public cade by inviting strangers to have coffee with them. The drivers responded with curiosity, but many ignored the happening. Space Incorporated: Ramstore Hypermarket and T Mobile. The transformation and commercialization of public space in Skopje is gradually speeding up over past few years. Participants appreciated the convenience, while worrying that gentrification will take away what remains of the city’s charm. T-Mobile, an international company and the number one provider of mobile and all sorts of telecommunication in Macedonia, has set up their advertisement in the most significant and the most obscure parts of the city. They have a large illuminated billboard right in front of the city’s main church. Other major corporates such as On.Net has advertisements, however the unbeatable quantity of pink T-Mobile sings are engrossing. The level of contagion from advertisement is still at an infantile stage, and it is fair to expect major growth in the near future. The most significant corporate space in Skopje is the ‘Ramstore’, a Turkish International Food store chain. Built in 2005, the store is a typical multi-shop department store. The ground floor is a large food store which has both local and imported products. The second floor has coffeehouses, bars, fast food, and clothing and etc. The size of the building is not overwhelming, but the conditions of interior space is spectacular with glittering reflection of shop windows and halogen lights. The locals adapt quickly to transform the cafes into a self service cafeterias. The multistory parking lot is new to the city. It foresees the future of suburban expansion based on individual mobility of automobile. The store is not excessively different from other multinational department chains, but the contrast in relation to the rest of Skopje is dramatic. The bazaar is the most ancient form of commercia space, then the City shopping mall near the city square built in the time of reconstruction of the city, and the Ramstore mall. 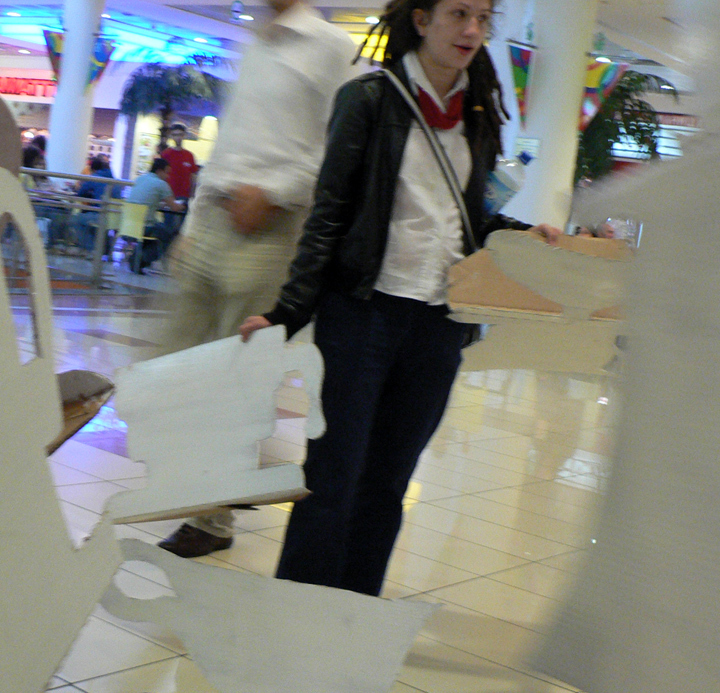 The participants had a radical idea to test the Coffee cup project in the Ramstore Mall. With a great excitement, we entered the store. The security guard noticed us, and we were told to leave the property immediately. Some participants tried to convince the authority, however it was unsuccessful. We managed to take few pictures and videos while this was happening. The action and failure prevailed the mall’s disguise as a pseudo public space. The incorporated space under tight surveillance and controlled. Skopje is still a very undiscovered city, therefore the locals are not yet open to public intervention or urban research. I faced some reasonable skepticism and tried to work around it. The local historian, introduced by the organizer, was very skeptical about finding documentation and literature about the city. His claim was that ‘everything was lost after the earth quake’. Instead of written documents, I focused on the oral history and try to depict the history written in the collective consciousness. A professor at the host university expressed a minor concern with the labeling of district by north and south is an incorrect and unproductive stereotype. I do agree and it was a conscious decision, because it is the most effective starting point to start conversation. Hopefully by the end of the workshop, the participants can overcome the initial stereotyping. The workshop was actually just two days. The participants were mostly young graphic design students at the European University in Skopje. They were extremely talented and eager to learn. For future research, I would like to know more about the effect of American army’s physical presence in the city. The United States is building a large fortress like embassy in the outskirt of the city, which is visible from the city. The press has been noting some Roman archaeological findings in the construction site of American military base. The controversy continues with evacuating of gypsies in the area. I would also like to check in few years regarding the gentrification of the city. This workshop had a small pool of participants from a private university and the opinions are inherently limited. Working with different local groups, ethnic, economic, and age, will result vastly different and possibly more interesting result.